You might want to prepare for an upcoming party as early as possible to limit last-minute scrambling, but blowing up the balloons early can lead to drooping balloons later without careful planning. Latex balloons are a party decoration staple. However, half inflated balloons can do more harm than good by deflating the party atmosphere. By following some easy and inexpensive steps, you will be able to keep your balloons inflated much longer than would normally be possible. Stretch out the latex balloons prior to inflating them by grabbing either end and pulling them in the opposite directions. Grab each side and stretch the two sides away from each other as well. Inflate the balloon and tie the bottom securely in a tight knot to help prevent air from escaping. Even if you are planning to tie a ribbon to the bottom of the balloons, the knot should still be tied as this will keep the balloons more securely shut than the ribbon alone. Spray the balloons with a mist of hairspray. This will help keep the air from escaping. Store the balloons in a large plastic bag until the time for the party. This will help prevent the balloons from deflating. Tie the bottom of the plastic bag shut with the balloons inside. Display the balloons away from lights and sharp objects. The heat from the lights can cause the balloons to burst. 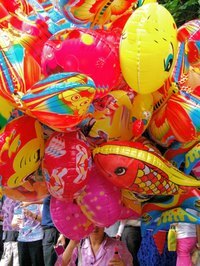 Sharp objects can puncture the latex of the balloons, also causing them to deflate. What Climate Do Helium Balloons Prefer? How do I Keep Balloons From Oxidation? What Kind of Rods Do Balloon Decors Use?